The Korean New Year, also called Seollal, is celebrated the on the first day of the Lunar New Year. This holiday is one of the most celebrated among all of the Korean holidays. Many countries around the world celebrate the first day of the New Year according to the Gregorian calendar, but in Korea, people celebrate Seollal as well. It is not certain when people started celebrating Seollal for the first time. However, according to The Memorabilia of the Three Kingdoms(삼국유사), a historical text from the early 13th century, court officials of the Three Kingdoms of the Korean peninsula gathered in the first month of the year to hold memorial services. They were similar to the memorial services still held today. During the Silla Kingdom’s 21st King Soji’s period (A.D 488), the people of Silla held memorial services on this special day, renewing their mind and bodies along with being prudent about their actions. According to historical texts, it can be assumed that Korean Seollal may have started during this era of the Three Kingdoms of Korea. In addition, Seollal has been established as one of the most important national holidays during the following Koryo and Chosun dynasties. Koreans begin every New Year’s Day with a bell ringing ceremony coming from a large bell pavilion called Bosingak in Seoul, Korea. 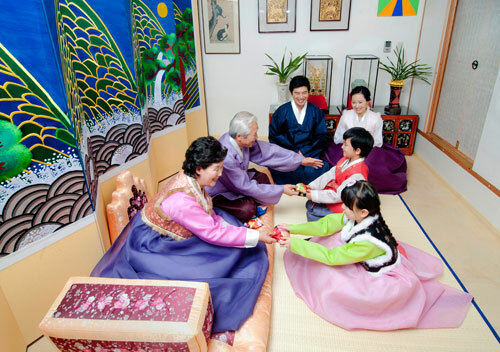 Seolbim is new clothing, usually traditional clothing called Hanbok, worn on New Year’s Day. The act of wearing new clothes symbolizes forgetting about the past and beginning a new start. In Korea, there are ancestral rites called Jesa served to remember ancestors on the anniversary of their death. Charye is similar to Jesa, but it serves a different objective: whereas Jesa is a more general term that includes various types of memorial services, Charye is done more specifically to give thanks to the ancestors on special holidays and usually is a commitment for all generations to serve this ceremony. The idea of all generations serving the ceremony is based on the virtue of filial piety. 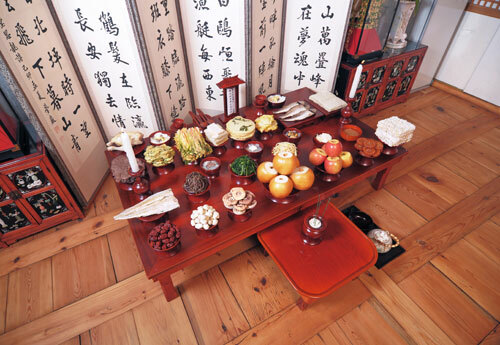 On the morning of Seollal, family members, each dressed up for the occasion, gather in front of the ritual lacquer table and set on it various foods according to the laws of ancestral rites. Each type of food is placed in a specific order and direction. Once set, the rite begins with deep bows as greeting to the ancestor spirits, and proceeds with offerings and prayers before ending with bidding farewell to the spirits. There are many types of food served during Seollal, but a main dish that cannot be missed is tteokguk (떡국), a rice cake soup. Tteokguk is made with garaetteok, a long white rice cake, as well as other ingredients such as garnishes of eggs, beef, and dried seaweed. Garaetteok is made as a long string, a symbol of health and long life for everyone in the family. In Korea, eating Tteokguk on New Year’s Day is believed to add a year to one’s age. Sebae is the name of the formal New Year’s greetings for the elders of the family. Sebae is done to show respect to the elders, and to wish them good health and a long life. The younger generations of the family gather take deep bows to the elders. Then, the elders return the Sebae with words of good wishes while children also receive Sebaetdon (New Year’s money) as a Seollal gift. 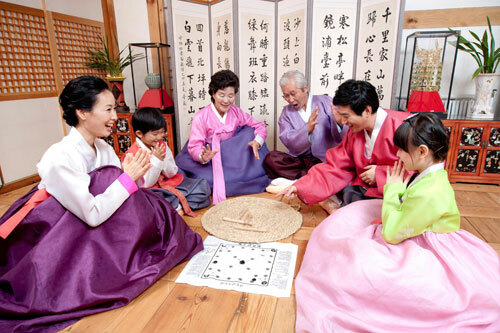 On New Year’s Day, the entire family gathers and plays traditional games. Some traditional New Year’s games include Yutnori, Jegichagi, and Yeon-nalligi. The most common activity is Yutnori, a board game that involves throwing four wooden sticks and moving a game piece across the board. This game is easy to learn and family members of all ages can enjoy playing it together. Jegichagi (a game similar to hacky sack) and Yeon-nalligi (kite flying) are also popular games played on Seollal.